A singer-songwriter who lives in Osaka. Began learning the piano from age 2. She was always surrounded by music from a young age for her father played the Japanese drums, and her mother was a member of a chorus group. In the 2nd year of junior high school, she began performing on the streets and became a member of a band for the entire 3 years of high school. Began performing at clubs in Osaka from the age of 17, and performed on the streets in Kita and Minami. On July 25th, 2009, did her first solo live concert at OSAKA RUIDO, and sold out her tickets. The concert was a big success. 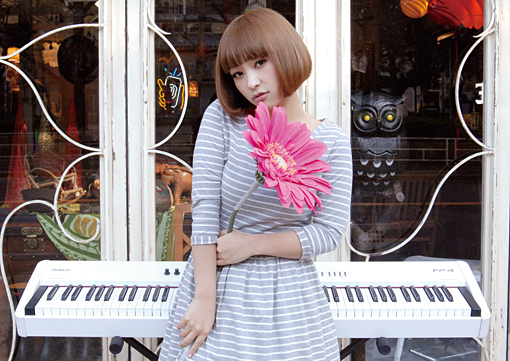 Her unique voice, memorable melodies, and melancholic lyrics, along with her energetic play style, which is reflected by her words, “isn’t the keyboard a type of drum?” has earned her many female fans. Her unique fashion sense has also got her to model for numerous fashion magazines such as CUTiE, girl’s style, Zipper, mina and Kaji Kaji. She has always ranked very high on model rankings.